MAGNUM formed as a house band of a night club in Birmingham in the early seventies. Quite some house band, as the nucleus of vocalist Bob Catley and guitarist Tony “The Hat” Clarkin still remains intact. Keyboard player Mark Stanway has been around since 1979, while Al Barrow, bass, joined in 2001, and Harry James (of TERRAPLANE/THUNDER fame) was added around that time too. The millennium was a time of hardship for the band, that was defunked for a while. But reformation came and along with it their comeback album “Breath of Life”. It was in turn followed by four more, if you count the almost new “The Visitation”. 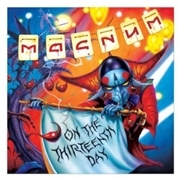 That brings us back to now, as MAGNUM release their 16th studio album. Can they return to form, or are they relying on former glories? Opener “All the Dreamers” is an odd choice to me, It´s over seven minutes long, and though it has many of the bands principal features it is too slow to latch on. Unfortunately I feel the same after both “Blood Red Laughter”, a tired take on the bands successes, and “Didn´t Like You Anyway”. The title track quickens the pace and is definitely a move in the right direction. The same goes for the slightly depressed but still more lively “Broken Promises” and the somewhat snappy “See How they Fail”. But the rough edges of “Dance of the Black Tattoo” is not well suited to the band name, and of the remaining tracks only “Shadow Town” is close enough to the MAGNUM I love. I wasn´t expecting a new “On a Storyteller´s Night”, but I wanted something more positive than this. It may be a solid musicianship, but a bit of heart and soul is missing. So I guess they´re neither living in the past or returning to to big deeds.